Punters who are looking for a quick, easy money out of sports betting might as well look the other way since the following article will not suit their betting preferences. Before they leave, however, they might as well reconsider their approach as making fast money on betting is an occurrence so rare that it might be even considered a statistical error. Those who take betting process seriously will attest to the claim. Betting is an extensive process which requires discipline, patience, and endurance. 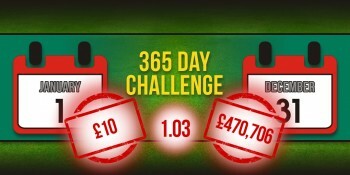 For those who are willing to invest time in order to boost their chances of earning money, we present a 365 Day Challenge that can help you turn £10 bet into a small fortune worth £500,000 over the course of 12 months. Every punter needs a well-developed system that will help them get closer to having a perfectly functional betting method which guarantees wins. Still, we are very much aware that there is no such thing as a certainty in a sport. Therefore, we will attempt to get as closer to it as possible. What we first need to find is a selection worth 1.03 betting odds. The odds as low as these are by no means guarantee that your selection will go through, but they will increase your chances significantly and lift them beyond reasonable doubt. Mind you, these odds are not that easy to find every day, but here is a little tip. With an imaginary scenario game such as Chelsea against Sunderland in the final round of the Premier League where Blues need a win to seal the title against already relegated side, the betting odds of 1.03 on Chelsea would be available for a number of markets. Still, when it comes to the Champions League final between Juventus and Real Madrid, the odds low-priced as these will be available in the Over/Under market. You can find them with the Over 2.5 selection, as well as with Under 5.5 so don’t tell us that the basic requirement of this 365 Day Challenge cannot be met every single day. Next, you need a starting bet worth affordable £10. Let’s face it, we all have a tenner to afford and right here with this particular challenge this exact amount is all you risk. How is that possible, you might ask? It is possible because you will be using the money you gained to fund your further daily bets and you will not be risking any more money from your daily funds aimed for grocery, shopping, rent or anything else. Simply put, you stake your winnings. It’s right here that we need to highlight once again that patience plays a key role with this challenge. You might not be aware that the progression of your bets – and wins for that matter – will go slow. Starting it with a £10 bet will earn you 30 pence on the second day when you will invest the total of £10.30 for the £10.61 on the third day. Fourth-day wins and investments stand at £10.93, then go to £11.26, £11.59 and so on. By the end of the first month, your tally will stand at £24, the second-month mark is set at £58.92, whereas the first quarter is finished with £143.00. The progression is quite obvious and can be quite appealing since not all of us will resist the temptation to collect our winnings and end the challenge as our tally reaches the £29.244,94 after 270 days. Those who manage to fight the urge and continue wagering with all they’ve previously earned will cross the finish line with £470,706.06 after 365 days. Only three days later and you will surpass the half-a-million mark with a £514,353.22 reward on a £10 starting bet.